Don't just take out word for it . . .
Pat and Colin met me to have an initial consultation; they are a team - a great team! . . . Pat Fish is a Celtic art specialist - period! I had brought with me several pictures of other high cross designs as well as photos of actual high crosses. We used those and sifted through more pictures that they had on file - more than one could ever imagine. Colin and I talked, and Colin created a digital mockup of a beginning idea, and then Pat offered her input. After a couple of hours, we landed on a final idea that was unique and exactly what I was looking for . . . On the day I arrived to get my tattoo, we did some last minute adjustments and then Pat started the work. Five hours later I had an amazing unique Celtic high cross on my back. Pat cares deeply about her work! . . . Thank you Pat and Colin for that amazing piece of art!!! I just returned from a trip to Dublin with my wife and 5 year old son. We made it a point to go see the Book Of Kells at Trinity College. Awesome experience. My little guy looked at the artwork on the pages and says to me, "Daddy, those look just like your tattoos!" I call that a wonderful endorsement for you and your art. Thanks again! You would be hard pressed to find a more skilled, knowledgeable, and ethical artist. Every session with Pat and Colin is a pleasure, and it's nice to be able to relax and know your skin is in the most capable of hands. If you’re considering getting something that's going to be with you for the rest of your life, you'd better find somebody talented and Pat has combined natural ability with years of experience to become one of the best artists around. She will guide you through the entire process, beginning with the design all the way through to helping make sure your new tattoo heals properly. Make the right choice and book a session with Pat Fish! I just wanted to drop you a quick note to thank you again for your beautiful artistry and care in giving me my first tattoo. I am so happy with the way it turned out. You bring such good energy and spirit to your craft and I appreciate how comfortable you and Colin made me feel. Thank you. Thanks again to you and Colin. It was truly a pleasure to spend time with both of you over the few days this spring. I left Santa Barbara feeling as though I'd made new friends. You both foster a very welcoming, safe environment for tattooing. You are clearly at the top of your craft. The experience has given me a new appreciation for true art in tattooing. I look forward to making a tradition of visiting Tattoo Santa Barbara in May. I don't have words adequate to express how much I love my new tattoo! Pat & Colin collaborated to come up with a unique and stunningly beautiful design incorporating the design elements I requested, and the result is a tattoo I will be proud to show off for the rest of my life. They are both perfectionists, and that really matters when it comes to tattoos -every line is steady and perfect, and the design is elegant and balanced. Pat also goes above and beyond any other tattoo artist I have ever met when it comes to keeping everything safe and sanitary. I wanted to thank you for the tattoo. You did a great job I really do love the work you did. Both you and Colin were great in making the experience a pleasant one for me. I feel very fortunate in finding you online and your system you have set up is the best I have come across. You really were able to give me the one on one attention that I was looking for instead of just "Get em in and Get em out" attitude that other tattoo shops have given off when I visited them. You have an amazing talent, skill and creative outlook. I am looking forward to my next tattoo with you. Still trying to decide if I want to go with my family crest or go with the arm band we spoke about. Either way, when I know for sure what I want next, I will be contacting you for another amazing experience. I wanted to say again thank you for the wonderful art! You and Colin did a wonderful job and I enjoyed my experience there. I just wanted to thank you both for the most enjoyable experience last Friday night. I absolutely LOVE my tattoo!! Pat you are truly blessed with an amazing gift - a true Artist! People are saying that your art work is one of the "most beautiful tattoos they have ever seen!!" Pat, I would just like to say that my experience at your shop was great! I took my Father and Mother to dinner last night and reveled what I had done and they were very proud and grateful for putting myself through the process, and I said "it couldn't have hurt more than you mom giving birth to me." They were really impressed with your detail to the hands and knot work and design. My mother took a picture of it to take to their class reunion today. My wife and daughter were also very excited about it and said you did a great job. 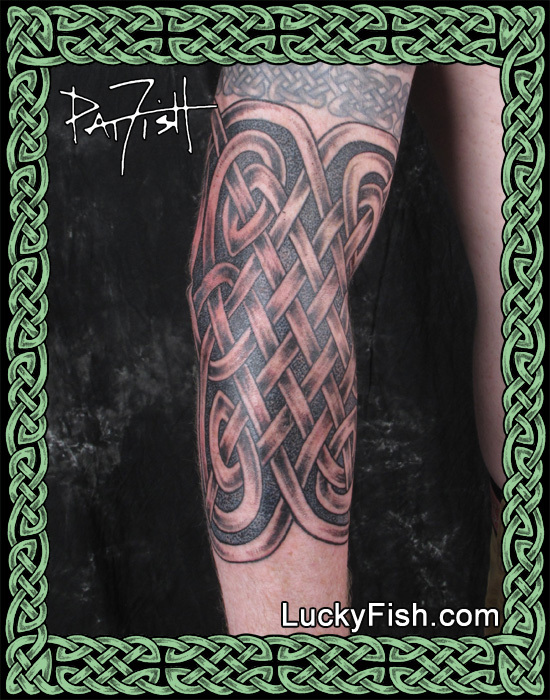 I would just like to say that I'm very happy with what you did and how it looks and my total experience with Tattoo Santa Barbara and yourself, Pat Fish,Truly a CELTIC ART SPECIALIST. Thank you and Colin. "I just wanted to thank you again and say how great of a job you did! My tattoo healed about 2 weeks ago and I am thrilled with how it turned out. It really couldn't have turned out any better. I have been getting complements ever since about the detail of the tattoo from friends and strangers. You made my first tattoo experience as comfortable as could be and am looking forward to getting more done from you. My brother and I also wanted to thank you for sharing a lot of information with us when we took you and Colin out to dinner after. We are very excited and looking forward to making an appointment to come see you again . . . "
"Pat and Colin were both wonderful, and I thoroughly enjoyed getting my tattoo!" What do you get when you combine the World's most preeminent and prolific Celtic tattoo Artist with a person who embodies the highest qualities and virtues of positive karma, caring and compassion not only for her clients, but I believe for her fellow man?????? And the answer is....Pat Fish! My BFMW “B” and I had been desiring tattoos for 10 years, and about a year ago began an intense research project on the art and artists of the tattoo world. Early exploration was in our locale –the Deep South. We soon realized we had to expand our map. Thankfully, “B” and I had already settled on Celtic art, him Irish, me Scottish, so when defining Celtic tattoo, one name became crystal, Pat Fish! I'm so glad we decided 2,337 miles was a short distance to go to get it done properly Celtic - the best decision ever - as we’d have missed the excursion experience and the optimum eminence in tattooing; Pat is an event. For all us non-artists, I think it's difficult to envision an artist's vision of what a piece of art is supposed to look like and/or will turn into and/or will look like before the first drop of ink deftly touches the canvas (aka skin). Fish sees things us non-artistic versions can't see or visualize, as she endures countless emails and design changes from clients struggling to show Fish what Fish already sees, with her only occasionally setting us straight but never becoming annoyed, although fully rightful to be exasperated (at least with me and “B”), so very Pat Fish! And BTW, for those like me and my friend “B”, who desired ink, but couldn't overcome our trepidation or visualize us two businessmen blanks walking into some "seedy" tattoo parlor, fear not, …………… there's Pat Fish! And let's not forget her sidekick Colin, wizard of computer art, visionary extraordinaire, intellectual beyond his years and devoted to Pat Fish ideals. Pat is a true Polymath/Renaissance Woman. ”B” and I are most honored to be her canvases from the South. It has been 3 months today since I was transformed into art! I just wanted to send a quick note thanking you both for all your help and talent in getting me a piece that I love. Every time I get to see it I can’t help but smile. You guys are a phenomenal team and I absolutely look forward to working with you again. Not sure what the next artwork will be, but when it comes to me I know where to go! Thanks again. I want to thank you for all your hard work involved in ensuring that I got the exact tattoo I wanted. Pat, you are a great artist and your expertise and confidence was very apparent. I felt completely at ease in the knowledge that I was in very experienced hands. Colin, your patience, unbiased advice, and genuine desire to help me fulfill my vision was obvious and very much appreciated. I already want another! Jean and I traveled to Santa Barbara, CA (from Kentucky) for our thirteen year wedding anniversary. We have been interested in getting a tattoo for some time and decided this would be part of our trip. The desire for a piece of quality body art actually dictated our vacation destination. 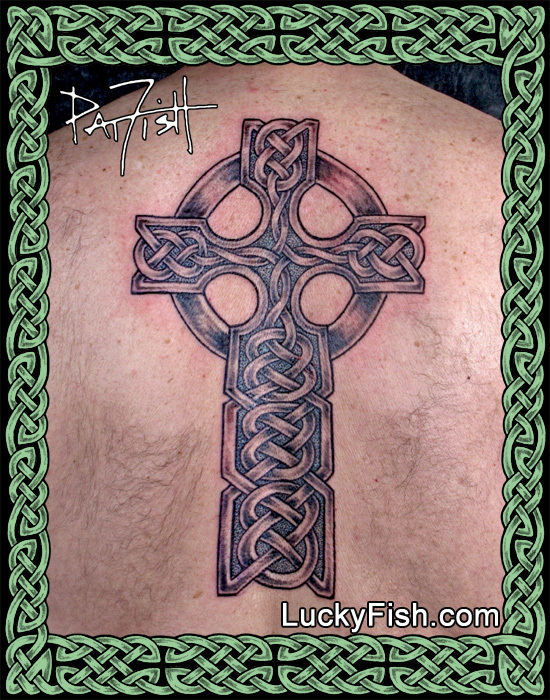 Being of Scotch and Irish descent I wanted a Celtic Tattoo that celebrated my heritage. After discussing and researching our ideas for a year, we made and appointment with the world famous tattoo artist Pat Fish. Pat is a true professional in all aspects of her craft. She and her assistant Colin helped Jean and me find the right tattoo. I found it very interesting that even after all the time we put into preselecting our art we both ended up with something a little different after discussing it with them. Was it necessary to travel to California to get a tattoo? No, but we traveled 2300 miles to have a beautiful piece of Celtic art installed on our bodies. It was worth every mile . . . And, yes it hurts. Well I am back in SNOWY Minnesota and wanted to take a quick second to say THANK YOU! The Weir Clan Buckler that you designed and did over this past weekend is truly awesome and I could not have asked for a better tattoo. I greatly appreciate all of your time and understanding while working on this little project and I could not have been more relaxed in the "chair" on Saturday. Totally a great experience and I hope that our paths will cross again someday. If not, I wish you nothing but the best and much success in your business.
. . . wanted to let you know that your artwork is now part of Irish Dance history as my Daughter’s new solo dress includes your handy work. Both of my tattoos are included on the dress and both are your designs. Just so you know I get asked all the time about my tats and my response is always the same. I always explain the meaning of the work, why I did it, and then where I had them done. Describe you as this cool chick out in Santa Barbara who lives and breaths the Celtic culture and knows her heritage and is focused on the Celtic themes: Pat Fish – a living legend. Two small tattoos by other artists become one piece with the addition of Celtic Knotwork.
. . . by the way, the lower back tatt you did for me more than 13 months ago, remains as colorful and distinct as ever and still gets complements and second-looks- the color is amazing. Totally freaks out the little old ladies at the health club. They keep asking me if it's real . . . no, I put it on every AM with magic marker! Why body art? For me it is a celebration of my body as it ages. It is fortuitous serendipity that I live in Santa Barbara, a mere 15 minutes from Pat, who is a true artist in addition to being the best at her craft. To celebrate my 70th birthday, Pat created the Heliotrope and Roses design from a photograph of this gorgeous plant in my garden. People complimenting my body art have said, “great tattoo, Pat Fish did that!” I love my tattoos, they are exquisite and unique. Additionally, I have had the unforgettable pleasure of spending time with Pat, whose art lives on my body. From a satisfied client's post online . . . I always wanted a tattoo and I knew that I wanted some kind of celtic artwork that symbolized infinity and the infinite wisdom and knowledge that I aspire to achieve. I also didn’t want something that everyone else has. After a bunch of research I found Pat Fish, who is known for her excellent Celtic artwork. Since I intend to keep the tattoo forever, I felt it was well worth the extra expense and plane trip to Santa Barbara to have her do it and have it be perfect. 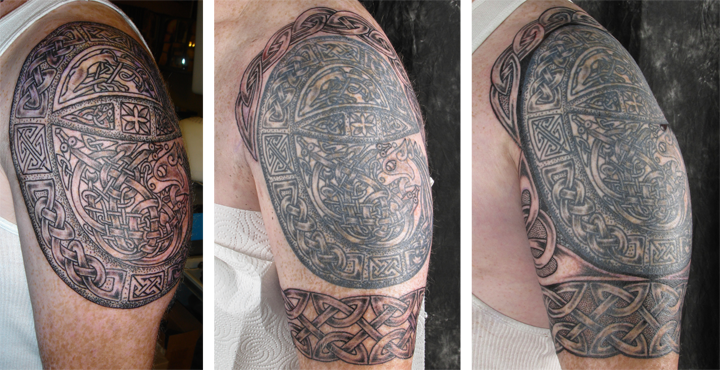 I am very happy with the results and would recommend Pat to anyone looking for a tattoo, especially any celtic art.